When Mayfield Fund Managing Director Raj Kapoor (MBA 1996), the cofounder and former CEO of Snapfish and fitmob, joined Lyft as chief strategy officer in 2016, he was intent on finding ways to reduce human impact on climate change. The solution turned out to be so central to Lyft’s future that it became its own initiative, with Kapoor as the head: “My goal—our goal—is to move to autonomous, electric, shared fleets,” he says, thereby unlocking simultaneous gains in safety, carbon emissions, and urban congestion. Lyft plans to ease the rest of its 23 million passengers into the new model gradually, city by city. Here, Kapoor takes your questions about what a self-driving future might look like. How does Lyft view a vehicle’s internal space when it becomes fully driverless? Is it an advertising space? A connected entertainment center? A personal transportation sanctuary? KAPOOR: The internal space will be very different. Up until now, cars have been designed for a scenario where everyone inside the cabin knows each other, but the predominant use case we have in mind is shared rides. Fully driverless cars can be optimized for the passenger instead of the driver, so we see a scenario with multiple types of cabins, and people can call up the one most suited to their needs. You might have a Sleep Lyft with 180-degree reclining seats, or a Work Lyft with 5G wireless connectivity and swivel desks, allowing you to do conference calls. Others might be optimized for entertainment or even meditation. Recently my home state revoked my privilege to drive because of a disability. 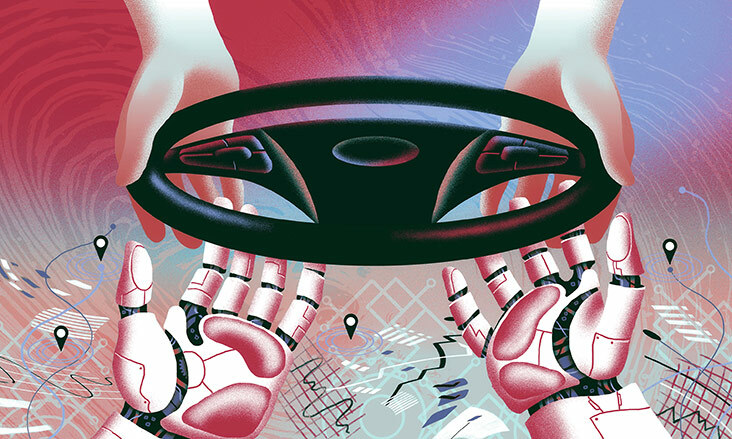 How long before driverless cars are a reality? KAPOOR: We think these fleets will be a game-changer for people with disabilities. The question is really when that will happen. The challenge is that the vehicles have to learn all the possible scenarios they’ll encounter on the roads, and they learn that by driving and simulating millions if not billions of miles. And those scenarios vary from city to city. Plus, autonomous cars are very expensive today. Those costs will have to come down before it can scale. How will autonomous vehicle fleet operations incorporate group rides to reduce the number of singlepassenger vehicles operating in urban areas? KAPOOR: Simply launching autonomous vehicles by themselves may not be enough to reduce congestion, emissions, and vehicles overall, which is a clear goal for the future of transportation. It has to be autonomous, shared, and electric. How will we increase shared rides? The match rate increases the more people use Lyft. We are also creating better matching algorithms and incorporating walking into the service to reduce the number of detours necessary and to increase matches. Cities are also talking about providing incentives for shared rides: London’s congestion fee, for example, might be waived for shared rides. We know that consumers care about the price, but we’re also finding that once passengers get into a shared ride they actually enjoy meeting new people and being the social animals that they are.